A room of her own: Ex-Babette's chef Stephanie Rastetter has opened a charming new bistro on the Petaluma waterfront. STEPHANIE Rastetter stands on the restaurant's outdoor patio squinting her eyes against the morning sunlight and sweeps her dark hair back with one hand as she surveys the murky Petaluma River flowing beyond. Water Street Bistro is her place. At age 36, dressed in casual baggy denim overalls and chunky black lace-up shoes, Rastetter looks more like a carefree college student playing hooky from psych class than a celebrated master chef and new restaurant owner. 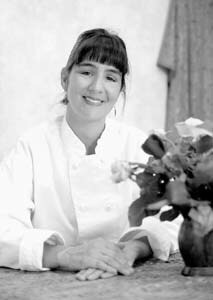 Who would guess that this warm, chatty young woman used to be one of two chefs at Babette's restaurant, a Sonoma County icon that consistently turned out some of the most innovative, expensive, and lauded cuisine in the Bay Area? For five years, the upscale French restaurant, concealed down an alley off Sonoma Plaza, was the county's answer to Yountville's French Laundry and San Francisco's Fleur de Lys. Its five-course, prix-fixe haute cuisine dinners became legendary among bon vivants and celebrants alike. And Rastetter, as sous-chef, co-created the dishes. These days she prepares homey soups and quiches and serves up breakfast and lunch (and soon dinner will be included) in her unpretentious, cheery new space. The menu boasts homemade waffles, sandwiches, and salads--and almost everything costs less than $6.75. "It's so casual here--it's like night and day from Babette's," she muses. "For me diversity is what's really fun. I loved cooking at Babette's, but I also like cooking other things, too, things more soul food­oriented or more rustic in their nature. "This place gives me the opportunity to do that." The bistro, tucked behind Petaluma Boulevard North, has a comfortable blend of mottled ochre and cobalt-blue walls, faux-leopard banquettes, oversized plants, and mirrors. Soothing jazz vocals and French torch songs ooze from the sound system. An old heavy golden curtain from Babette's is draped casually over a drinks cooler. Outdoor dining on the small patio by the river completes the laid-back picture. Despite the difference between the two restaurants, the commitment to serious, well-thought-out food prepared with local ingredients remains the same. "I like to offer people something a little more challenging in the food department than they're used to, but in a really comfortable environment, so that people can get a little more adventurous," explains Rastetter. Check out her pickled black-eyed peas, warm turkey and ham muffaletto, crab chowder, or chicken hazelnut terrine and you'll see that Rastetter's downhome comfort food has a certain global sophistication. This is the place to go if you fancy a glass of rosé with your classic BLT. A GRADUATE of the City College Hotel and Restaurant program in San Francisco, Rastetter has had an 18-year cooking career, including San Francisco stints at the prestigious Campton Place with Bradley Ogden and at Regina's with Regina Charboneau. When Charboneau opened a second Regina's in the Sonoma Hotel several years ago, Rastetter followed. That's where she met future Babette's owners Daniel Patterson and Elizabeth Ramsey. Rastetter began cooking at Babette's on the day the restaurant opened in 1994. She stayed there until the eatery closed last June. She veered from her kitchen duties only in the final eight months to manage Babette's more casual wine bar cafe, in order to spend more time with her two small children. During Babette's rule, the food world heaped accolades on Chef Patterson while Rastetter toiled in obscurity. In 1996, Food and Wine Magazine named Patterson one of "the 12 best new chefs in America." Meanwhile, Rastetter worked quietly, creating half of all the courses served in the brocade-and-velvet dining room each week--a huge accomplishment with little recognition. But Rastetter insists she was content to stay in the background. "Babette's was always billed as this husband-and-wife team, with Elizabeth in the front and Daniel in the back, so maybe it just made more sense to keep it that way," Rastetter explains. "But just knowing that I did a lot of the cooking and that people were liking it was satisfaction enough." These days, as chef and restaurant owner, Rastetter is able to blend her culinary expertise and considerable people skills, urging her guests (read: patrons) to share food and conversation. "I love to encourage people to be a little more communal with their eating," she says. "You can try more, experience more, and you're not committed to the same flavors for the entire meal." In June, Water Street Bistro will open for dinner with table service (right now orders are taken at the counter). Rastetter promises light fare that will allow people to "graze" their way through dinner. "I envision items like a grilled fish with a vegetable ragoût in a little broth and green olive oil, or a warm entrée salad like duck confit with frisée, or roasted fingerlings and roasted onions," she adds. "I also see tapas here at night, some sangría--maybe we'll bring in a flamenco guitarist." But what Rastetter visualizes most is the birth of a new community gathering place, with this small bistro's slight echoes of a stripped-down Babette's and its welcoming ambiance. "It's not just dinner, it's a chance to reach out and interact with other people besides just the people you go to dinner with," Rastetter explains with a smile. "It's interesting, because by some gift of God or whoever, this space seems to make people do that." Water Street Bistro (which actually faces Water Street) is located at 100 Petaluma Blvd. N., Suite 106 (at Western Avenue), Petaluma. Open Monday to Friday, 7:30 a.m. to 5 p.m.; Saturday,7:30 a.m. to 4 p.m.; and Sunday, 8:30 a.m. to 2:30 p.m. In June, the restaurant will open for dinner Friday and Saturday, from 5 p.m. to 8:30 p.m. 763-9563. From the May 4-10, 2000 issue of the Sonoma County Independent.